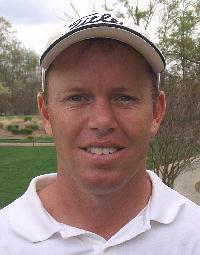 CHARLOTTE -- David Seawell of Columbia became this year's first two-time winner on the Tarheel Tour when rain washed out Thursday's final round of the Coulter Real Estate Classic at Raintree Country Club. Seawell captured the $9,000 first-place check with rounds of 65 and 66 for a 13-under total of 131. He birdied the final two holes in Wednesday's second round, which turned out to be the margin of victory over second-place Fernando Mechereffe of Charlotte. "It's nice to win, but I would have felt better if we had played today," said Seawell, a former USC All-American and PGA Tour player. "Fernando is having such a good year that I was looking forward to playing against him and testing my nerves and having to go out and match his number. That being said, I guess I am very fourntuate to have birdied the last two holes (Wednesday)." The victory was the season's second for Seawell, who also won the Rocky River Classic in early April. He's now second to Mechereffe on the tour's 2005 money list with $27,228.73 in earnings. Not bad for a guy who gave up competitive golf for four years following a rough season on the PGA Tour in 1999. "I did not fare very well here at Raintree last year. It was only my fifth tournament coming back from the layoff and I was rusty," Seawell said. "I debated about playing this week, but I really played well and was pleased. I felt like I putted incredibly. In two days there was maybe one putt I felt like I should have made but didn't. A lot of this win was on my putting. I hit a lot of greens and only made two bogeys all week." Mechereffe, a former All-ACC player at N.C. State, wound up second with rounds of 64 and 69 for a 133 total. He won $5,000 to push his tour-leading winnings to $28,239.58. Luke Stephen of Kennesaw, Ga., finished third at 134. The former Kennesaw State All-American took home $3,000, while Brian Quackenbush of Fairfax, Va., Blake Adams of Eatonton, Ga., and Charles Frost of St. Simons Island, Ga., tied for fourth at 136 and earned $2,083.83 apiece. Tommy Biershenk's 64 in the second round propelled him into seventh place at 137 and earned him a $1,500 payday. Next up on the Tarheel Tour is the Kannapolis Classic, Aug. 23-25 at Kannapolis Country Club in Kannapolis, N.C.